Have you ever wondered, whilst munching those sumptuous chocolates, breathing in the fragrant aroma of those freshly cut red roses or tucking into that delicious meal, about this Valentine's thing?!! Where did it all come from?...Who is this Saint Valentine fella? Yes, we all know it's about love and romance...but why?...Well, legend would have it that the origins are actually quite bloody and dark...and a little confused!! So who was St. Valentine? There are several theories pointing to the true identity of Valentine or Valentinus; the Catholic church recognises three such saints, all of which were martyred! One legend suggests that Valentine was a priest that served in Rome during the third century. During this time Emporer Claudius II decreed that single men made better soldiers than those with wives and families and thus outlawed marriage for young men. The priest, Valentine, opposed to the injustice of the decree defied Claudius and continued to perform marriages in secret. Unfortunately for Valentine his actions were discovered and Claudius ordered that he put to death!! Another theory suggests that Valentine was executed for attempting to help Christians escape harsh Roman prisons where they were beaten and tortured. According to one legend, and probably the most romanticised, an imprisoned Valentine actually sent the first "Valentine" greeting himself after he fell in love with a young woman, possibly the jailor's daughter, who would visit him during his incarceration. Allegedly, before his death, he wrote her a letter and signed it "From your Valentine"
While some believe that Valentine's Day is celebrated in the middle of February to commemorate the anniversary of Valentine's death or burial, which occurred around A.D. 270, others support the theory that the Christian Church decided to place the festival of St. Valentine around the same time in an effort to "Christianise" the Pagan celebration of Lupercalia. This fertility festival was dedicated to the Faunus, the Roman God of agriculture as well as the Roman founders Romulus and Remus. Roman priests belonging to the Luperci order would start the festival by gathering at the sacred Lupercal cave in Rome where the infants Romulus and Remus were believed to have been cared for by a she-wolf or Lupa. The priests would sacrifice a goat, for fertility, and a dog, for purification. After the sacrifice, two of the Luperci priests would approach the altar where their foreheads were annointed with blood from the sacrificial knife, then wiped clean with wool and soaked in milk, they were then expected to smile and/or laugh!! A sacrificial feast followed, after which the Luperci cut thongs (known as februa) from the flayed skin of the victim, and ran with these, naked or near-naked, along the old Palatine boundary, in an anticlockwise direction around the hill slapping eagerly awaiting women with the blood soaked hides to supposedly promote fertility!! Later in the day, the young women of the city would place their names in a large urn where the bachelors would randomly choose a name and be paired up for the year..these matches would often end in marriage...how romantic!! 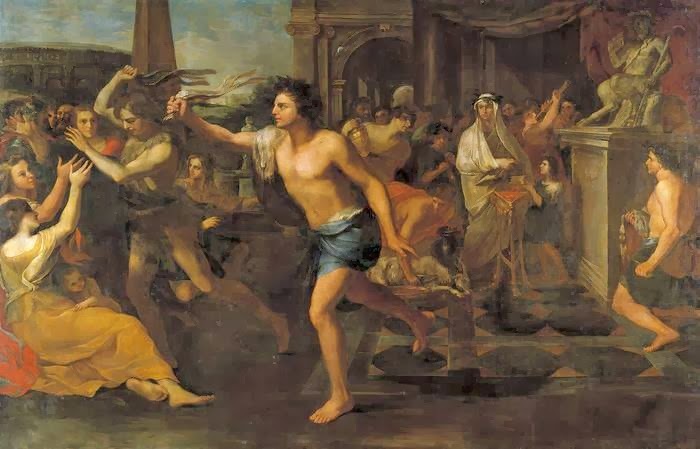 Lupercalia was eventually outlawed by Pope Gelasius at the end of the 5th century as it was deemed un-Christian; he declared February 14th simply as Valentine's day. At around the same time, the Normans celebrated Galatin's Day (Galatin meant "lover of women"). It's thought that, because the two names sounded similar, they became confused with each other and somehow morphed into one!! During the middle ages, it was commonly believed that February 14th heralded the beginning of the birds' mating season in England and France perhaps adding to the idea that Valentine's Day should be a day of romance!! Written Valentine's messages between loved ones didn't begin to appear until after the 1400's. A poem written in 1415 by Charles, Duke of Orlean, to his wife whilst he was imprisoned in the Tower of London following his capture at the battle of Agincourt is the oldest known written Valentine message in existence. Valentine's day became more popularly celebrated around the 17th and 18th centruries where it was common for friends and lovers of all social classes to exchange hand written notes and small tokens of affection and by the 1900's printed cards began to replace written letters. These days, the Valentine's celebration, is probably second only to Christmas in terms of revenue; millions being spent on cards, chocolates, flowers etc etc...as well as jewellery of course...something we have in abundance at Spangle! !